As a company committed to sourcing from certified sources, you want confidence in the claim you make about your product. That’s why Chain of Custody (CoC) is an essential component of any sustainability certification system. CoC is the process of tracking a product from a certified farm through the various stages of trading, manufacturing and warehousing to assure the end consumer that the claim being made on the product accurately reflects the certified content or sourcing of that product. This protects the credibility of the Rainforest Alliance Certified™ seal, which marks the product as one that has been responsibly produced. The Rainforest Alliance has developed an innovative CoC system that establishes risk as the fundamental criterion for the type and frequency of audits for companies sourcing from Rainforest Alliance Certified farms. As of December 3, 2018, we are implementing the mutual recognition of the Chain of Custody certification process, available to existing Chain of Custody certificate holders of either of the current standards, UTZ or Rainforest Alliance. This means that companies can work with both Rainforest Alliance and UTZ certified products, by having one Chain of Custody certificate in place for either one of the current programs. This change is being rolled out with the goal of reducing the administrative costs for companies, as well as streamlining the audit process to reduce the burden of being dual certified. For more information and to take advantage of this opportunity, see our mutual recognition guidelines. A company that takes physical and/or legal possession of a product originating from a Rainforest Alliance Certified farm and makes promotional, on-package or sales claims regarding the certified status of these products must go through the Rainforest Alliance CoC process. The unique aspect of our scheme is that the process is calibrated to the level and type of risk. The keystone of the new risk-based approach is the CoC Risk Assessment (CRA). Companies that have a higher potential for mixing non-certified products with certified products will generally score as higher risk, while companies that source or offer exclusively Rainforest Alliance Certified products, or that don’t mix or blend at all, are treated as lower risk. Companies also receive credit (a reduction in risk rating) for achieving high levels of compliance with Rainforest Alliance guidelines and policies, as well as for having passed the audits of other credible certification programs. In addition, companies sourcing small volumes of certified products—for whom the cost of an audit would not be justified by the sales of their certified products, and whose limited activities pose a minimal credibility risk to the Rainforest Alliance trademark—will be treated as very low risk and exempted from audits completely once they are found to be in compliance with the Rainforest Alliance’s traceability, licensing and trademark guidelines and policies. Companies that are new to the process and have just recently decided to purchase products from Rainforest Alliance Certified farms must register in Marketplace, our traceability and trademark portal. Upon registering, you will receive an email with a password for Marketplace, as well as general information, including information on Rainforest Alliance Chain of Custody certification (CoC). After registering in Marketplace, companies that fall within the scope of our Chain of Custody Policy will be in touch with our Claims, Traceability and Trademarks team to complete a Chain of Custody Risk Assessment (CRA). The CRA consists of a series of questions about the company’s operations. The results of each CRA will be reviewed by RA staff and compared to our records of these company’s compliance with traceability, trademarks and licensing requirements. Companies will receive their risk result (very low, low, medium or high risk) and instructions on next steps. For companies receiving a very low risk result they will receive the CoC Endorsement. For companies receiving a low, medium or high risk result they shall contact a Certification Body to achieve CoC Certification within 12 months of receiving their risk result. It is important for companies to work with our Traceability and Trademarks teams in order to comply with CoC Certification. Certification Bodies will provide a budget for the certification audit and work with you to schedule the audit. The audit will be based on the Rainforest Alliance CoC Standard and Policy. The auditor will review the companies’ applicable systems for Management, Traceability, Trademarks (when applicable) and Multi-site criteria (when applicable). If the compliance and audit results are positive, and all relevant certification or endorsement payments and agreements have been finalized, then the company will be issued a CoC certificate or endorsement. Each company is expected to maintain its systems and continue compliance with Traceability and Trademark requirements in order to maintain their certification. For any questions, please contact our Claims, Traceability and Trademarks division at agcoc@ra.org. See all binding documents, including standards and policies, applicable to CoC participant operators in the Resource Library. 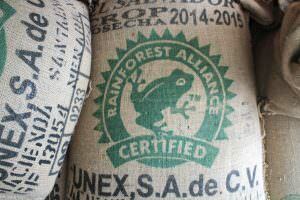 Rainforest Alliance certification is carried out by authorized certification bodies. Chain of Custody operations can be certified in any country, as long as the certification body in question is able to offer this service. To apply for certification, find an authorized certification body.